Titanium is extremely lightweight and will not rust, making it a very popular and relatively new material for eye glasses frames. Titanium’s strength allows it to be made thin, but it is hard to solder or weld and is expensive. Titanium is a more expensive metal composite used in eye glasses frames known for its beneficial qualities of strength, lightness, and flexibility. However, titanium is very difficult to color so titanium frames usually come in a very restricted range of eyeglasses frames colors. Eyeglass frames that are 100% titanium are also a hypo-allergenic–they do not contain any nickel which causes allergic reactions in some people. There are many other allergies (to plastics, stainless, and various other materials commonly used to make eyewear), and 100% titanium eye glasses frames are a good choice for people with allergies to any of these materials. 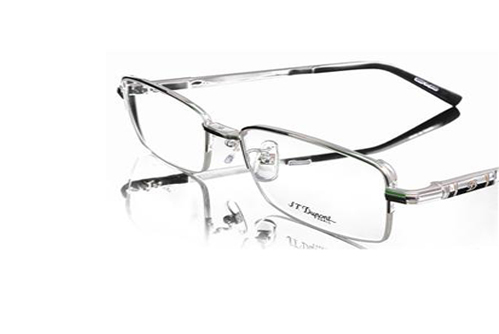 Many designer eye glasses frames brands use titanium in some part of their collection. Sometimes called “Alpaca” or “German Silver”, nickel silver is rigid compared to other more malleable metals. Nickel silvers contain more than 50% copper, 25% nickel, and the rest zinc (no silver at all). Copper adds pliability, zinc adds strength, and nickel gives it its namesake color, a whitish appearance, because when the nickel content exceeds 12% the copper color no longer shows through. Although the metal is lustrous, its brittleness makes it a poor choice for slender frame fronts and nose pads. Thus, it is better designed for use in hinges, endpieces, bridges and ornamental trims, as well as an inner core for temples. Flexon is a trade name for one company’s flexible eyeglasses frames material. Flexible eyeglass frames are available in many compositions, but the goal is always the same. This kind of material is used in eyeglass frames in order to reduce breakage. It is normally found in the shaft of the temple and in the bridge, and it allows these areas to endure tremendous twisting without breakage or permanent distortion of the frames shape.